Montreal mortgage rates are only moderately competitive compared to other big cities in Canada, but they’re the most competitive in Quebec. These are the lowest rates from providers with offices in or near Montreal. For a listing of providers across the province, check the best rates in Quebec. Mortgage Market Overview: Montreal’s mortgage market is dominated by local mega-lenders, Desjardins and National Bank. It’s also home to the greatest concentration of mortgage brokers in Quebec, which drives price competition among all lenders. 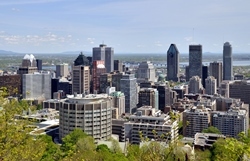 City in Brief: Montreal is the largest city in Quebec and the second largest in Canada. The city takes its name from the prominent natural landmark Mount Royal located in the heart of the city. Situated on the island of Montreal, the city is a popular tourist destination and has been named a UNESCO City of Design. French is the predominant language spoken at home (56.9% of residents), followed by English at 18.6% and other languages at 19.8%.